Researchers at Emory University have developed an innovative standalone app that can detect anemia with an accuracy on par with currently available point-of-care tests. Users need only to take a picture of their fingernails, then an algorithm looks for certain characteristics that may suggest the blood condition is present. There is no need to draw blood or for any external equipment. Anemia is the most common blood condition in the U.S., affecting about 5.6% of the population. Worldwide, about two billion people are affected by the blood disorder that can cause fatigue, paleness, and cardiac distress if left untreated. The condition arises when there’s a lower-than-normal amount of red blood cells or hemoglobin. Hemoglobin is an iron-rich protein that helps red blood cells carry oxygen from the lungs to the rest of the body. If you have anemia, your body does not get enough oxygen-rich blood, which can leave you feeling tired or weak. Mild to moderate anemia can be treated with over-the-counter or prescription iron supplements, certain vitamins, intravenous iron therapy, or medicines. Severe anemia, however, might require red blood cell transfusion. Such is the situation of Rob Mannino, a biomedical engineering graduate student at the Emory University School of Medicine, who requires monthly blood transfusions due to beta-thalassemia — an inherited blood disorder caused by a mutation in the beta-globin gene. It’s the hassle of having to regularly go to a hospital to have his hemoglobin levels measured that drove Mannino to work tirelessly on a non-invasive detection of anemia. Along with colleagues, Mannino developed a smartphone app that is remarkably accurate at detecting the blood condition. The team first analyzed fingernail photos and correlated the fingernail beds with hemoglobin levels measured in 337 people with the complete blood count (CBC) — the current standard in anemia detection. Some of the participants were healthy, others had a variety of anemia diagnoses. The algorithm used to detect blood hemoglobin levels from fingernail color was trained on 237 of the participants and tested on 100. A single image taken with a typical smartphone was enough to measure hemoglobin level with an accuracy of 2.4 grams/deciliter and a sensitivity of up to 97%. The researchers note that personalized calibration, which was tested on four patients over the course of several weeks, can improve the accuracy to 0.92 grams/deciliter, which is on par with point-of-care hemoglobin tests. The results were reported in the journal Nature Communications. 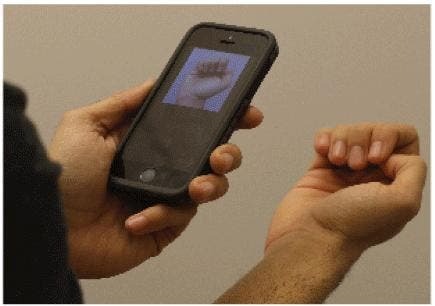 Since the fingernail beds do not contain melanin, the non-invasive smartphone-based test can be used by virtually all people, with a variety of skin tones. In order to correct for background brightness, the authors of the app used image metadata. This information can be adapted for multiple manufacturers so that results can stay consistent whether the user owns an iPhone or an Android device. The app is meant only for screening and not for clinical diagnosis. Nevertheless, this doesn’t make it any less convenient, seeing how it can be used by anyone at any time. The app is especially useful for pregnant women or athletes, but also for patients with chronic anemia, who can now monitor their hemoglobin count by themselves. This way, these patients may reduce complications associated with transfusing too early or too late, which can happen quite often. And while the app isn’t meant for diagnoses, it could be the next best thing for people living in developing countries who can’t afford or do not have access to a hospital. In time the researchers hope that their app becomes as accurate as the current state of the art in anemia diagnosis. The smartphone anemia app should be available for download in spring 2019.